Bemærk! KOPAN RICE er lukket lige nu, men de åbner igen mandag d. 22. april kl. 12:15, så du kan bestille din mad allerede nu. Kopan is the first Korean street vendor in Copenhagen. After much anticipation, they are opening their first food store for the first time in four years. The name of the store is KOPAN RICE where food lovers can experience diverse Korean food with the concept of a snack bar. Having a seat capacity of 30 people, the restaurant offers Danes unfamiliar with Korean food an opportunity to experience Korean food. KOPAN RICE provides visitors with a wide variety of choices. Traditional Korean meals are noted for the large number of side dishes (반찬; banchan) to complement the main dish. 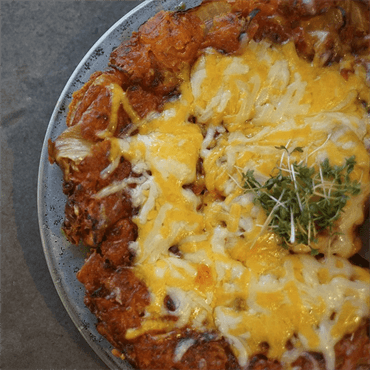 Visitors can naturally experience Korean food culture by ordering side dishes such as Home-made Kimchi, dumpling, jeon, Tteok galbi, jab chae, soup according to their taste. KOPAN menu is sufficient for one meal. Kopan's signiture menu " Rice bowl " offers a beautiful harmony of colors and an equally healthy and balanced nutrition. It also represents the flexibility of Korean culture, where different cultures are taken in, understood, and drawn together to create new developments. Bibimbap is probably one of the most well-known and beloved Korean dishes to many people. The verb “bibim” refers to the act of “mixing different ingredients together.” Combined with the noun “bap,” which refers to rice, the mouthwatering idea of bibimbap is born. 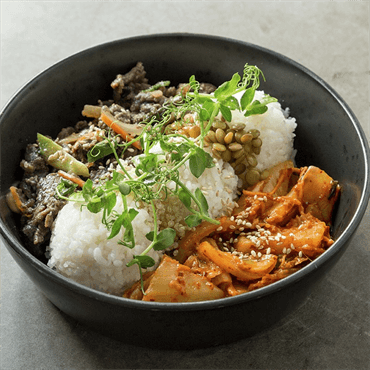 As can be seen from its name, bibimbap is a dish that combines rice, vegetables, meat, sesame oil, and gochujang in a single bowl to be eaten with a spoon and chopsticks. It is now one of the most well-known names in Korean cuisine. 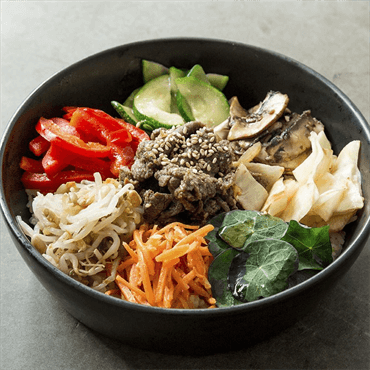 Bibimbap offers a truly unique package of flavor and nutrition in a single meal. The combination of fresh vegetables of various colors, rice, and meat fills the bowl with a sense of harmony achieved with a low caloric intake. served on a bed of rice in one bowl ( Carrot, Paprika, Mung bean sprout, Zucchini, Celeriac , Nasturtium , Sesame seed & oli) with a spicy Gochujang chilli sauce. Kimchi, Korea's most famous slow food, is made with the wisdom of the ancient Koreans in salting, storing, and fermenting vegetables such as radish or napa cabbage. 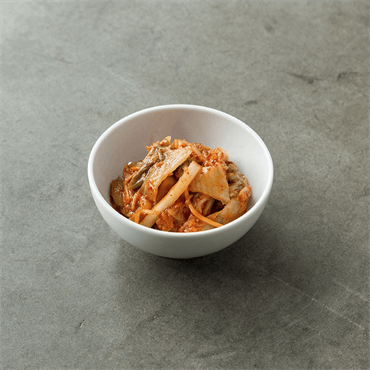 With more than 15 ingredients in play, Kimchi takes the natural taste of the ingredients and enriches it with its unique acidity, made through an extended period of fermentation, with corresponding richness in Lactobacilli and vitamins. 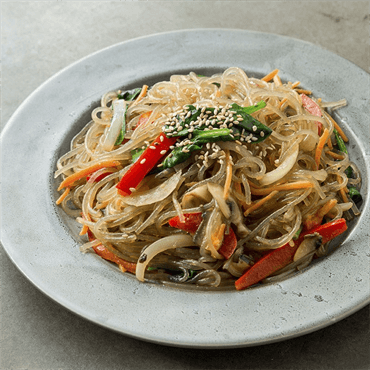 A combination of chili pepper, garlic, and ginger creates a crisp flavor and helps digestion, creating the health benefits that make Kimchi is well-known in the world. 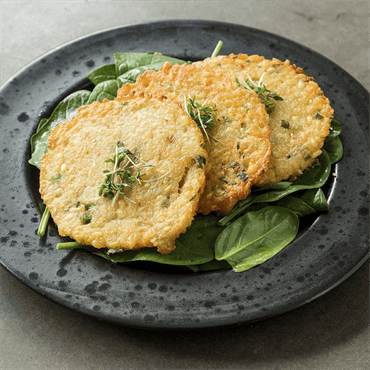 Mung-bean pancake served with spinach salad & soy dipping sauce, garden cress. Sweet potato noodles, vegetables stir fried in soy sauce (vegi). Sweet potato noodles, paprika, zucchini, onion, mushroom, soy sauce, sesame seed & oil.